With thanks to The Friendly Atheist, which published this essay here. I found one! I found one! I found an atheist mom on TV! Yes, I am one of those minority types hungry for representation in mainstream entertainment, watching avidly to see how, say, Dr. House does or doesn’t ring true as an atheist. And also watching avidly just because, goodness, there he is, saying unsayable things like, “Rational arguments don’t usually work on religious people. Otherwise there would be no religious people.” Oh, House. But of course most atheists are not genius misanthropes. Some of them are gorgeous, high-powered attorneys with perfect wardrobes. Alicia Florrick, a.k.a. The Good Wife, is an unapologetic atheist, a fact that occasionally becomes a plot point, as it has during this season’s run for State’s Attorney. In an excruciating interview with a pastor (presented as a necessary step in her campaign process), she tries neither to lie nor to confirm that she’s an atheist: “Well, I can’t say for certain that God doesn’t exist,” she says, and, “Recently, I have looked for answers outside of myself.” Oh, lawyers. Alicia parents two children as well as she can in those form-fitting suits, but she is not an atheist mom. She shows no interest in sharing her worldview with her children; in fact, her daughter is an evangelizing young Christian. I suspect that Grace (Grace!) is a fervent believer to allow us to continue to sympathize with her mom. It’s OK if a grown-up has doubts about God, even if she doesn’t believe. It’s not so OK if she raises her kids that way. “Bones” Brennan on Bones is a staunch atheist, too, but turns out to be “open-minded” enough to have her daughter baptized. So imagine my surprise at finding an atheist mom in a classic Christmas movie. OK, they don’t actually say she’s an atheist. 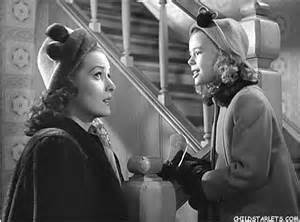 But make no mistake: Miracle on 34th Street (1947) is about faith in God, not just in Santa Claus. The word “believe” occurs 35 times in the script; “faith,” 5. The mother, Doris Walker, is career woman, a divorced single parent, and a nonbeliever. The fact that she doesn’t believe in Santa does not distinguish her from the rest of the adults. The film, as you may recall, culminates in a courtroom hearing during which (1) the State of New York concedes the existence of Santa Claus, and (2) the kindly old man we know as Kris Kringle is declared to be the real Santa. But, at least until the final moment of the movie, none of the film’s grownups believe it’s true. When they say they do, they are clearly lying—either for political reasons (the Judge) or commercial ones (Mr. Macy) or because they don’t want their children to know they lied to them (the District Attorney). MR. GAILEY: No Santa Claus, no fairy tales . . . no fantasies of any kind, is that it? MRS. WALKER: That’s right. I think we should be realistic and completely truthful with our children and not have them growing up believing in a lot of legends and myths like . . . Santa Claus, for example. Later, when she’s explaining to Mr. Gailey why she’s upset with him for taking her daughter to see Santa, we find out why she’s so insistent on this philosophy. MRS. WALKER: By filling them full of fairy tales they grow up considering life a fantasy instead of a reality. They keep waiting for Prince Charming to come along. And when he does, he turns out to be a . . .
MR. GAILEY: We were talking about Susie, not about you. SUSAN: They were in the basement playing zoo and all of them were animals. When I came down, Homer (he was supposed to be the zookeeper) he said, “What kind of an animal are you?” and I said, “I’m not an animal, I’m a girl.” And he said, “Only animals allowed here. Goodbye!” So I came upstairs. KRIS: Why didn’t you tell him you were a lion or a bear? SUSAN: Because I’m not a bear or a lion. Of course, Mrs. Walker, has believed in many things—not least, in telling her daughter the truth—just nothing for which she has no evidence. Faith in something unprovable (or even patently untrue, like Santa) is in this movie equated with faith in people, faith in love, the capacity for hope. Again and again, Mrs. Walker’s insistence on logic and evidence is portrayed as dashing her daughter’s hopes. Little Suzie overhears Santa speaking Dutch to a little immigrant orphan, which makes her think, maybe . . . But when she runs to tell her mother, Mrs. Walker replies, “Susan, I speak French, but that doesn’t make me Joan of Arc.” Ouch. Even weirder is the fact that the movie equates belief with imagination, with playing pretend. When Kris Kringle teaches Suzie to use her imagination and pretend to be a monkey, we are meant to think he’s opening up a whole world in which a child could believe in Santa Claus. Starting her sleigh down that slippery slope. But when you imagine things, you know they’re not true. That’s the fun of it. Believing Santa (or God, for that matter) is real is entirely different from pretending he’s real. The arguments may be illogical, and Mrs. Walker may be a bit of a straw mom (she doesn’t even sing to her child, for goodness sake), but Miracle on 34th Street has a lot to recommend it. Kris Kringle is willing to work as a Macy’s Santa because he’s fed up with the commercialism of the holiday, and although the solution is in itself laughably commercial (the big department stores help shoppers find the right presents even if it’s at another store), the characterization of competing retail giants and their marketing departments still has a nice satirical kick. So too the political calculations on display in the courtroom scene. Mrs. Walker, for all her tragic flaws, loves her child and excels at her job. Remarkably, the movie’s happy ending does not require her to quit that job, or imply (as does the 1994 remake) that she should have more kids. It does, however, require that she see the light. That she renounce her “silly common sense” (her words), for herself and for her daughter. SUSAN: Mommy said if things don’t turn out just the way you want them to the first time, you’ve still got to believe and I kept believing. You were right, Mommy! Mr. Kringle is Santa Claus! Susan runs off, leaving Mr. Gailey to ask, wonderingly, “You told her that?” And when Mrs. Walker nods, he gives her a grand, 1940s Hollywood kiss. Just like that—just by reversing her position on the truth and teaching her daughter to believe—Mrs. Walker becomes lovable. It comforts me to imagine what House might say about this. And I say that knowing perfectly well he’s not real. Click below for the recorded version of my first PechaKucha night, at the Opalka Gallery, Albany, New York. PechaKucha is a presentation format with strict parameters: 20 slides, 20 seconds of narration for each. So if I seem to be speaking extra slowly or suspiciously quickly at certain points, that’s why. Thank you, Jesse, for the musical assist. And thank you, Liz, for the original invitation.